In recent years, more and more Americans have been sitting down to the dinner table and wondering “What am I eating, and why?” Thinking through these questions quickly leads to a set of questions about our broader food system: the national, state, and local networks and processes that create and transport food to our plates. This look into the national and global food structures, recently undertaken by an increasing number of Americans, often points to some disconcerting conclusions regarding the impacts of the current system on our health, our environment, our national and local economies, and the welfare of our food and farm workers, as well as our animals and livestock. This exploration of what ends up on our plates exposes a set of processes that is likely unsustainable for the long term. In the face of the obesity epidemic, researchers have encountered a surprising fact; differences in food access between neighborhoods (the type and number of food stores available to residents) are associated with differences in health outcomes for entire neighborhoods. For much of the past ten years, researchers have been publishing astonishing findings in regards to the association between limited food store access and health problems (notably, obesity). National attention to obesity, diabetes and other health issues have provided an opening to examine eating habits and access to food. The food chain itself, which starts with agriculture and ends at our dinner table, constitutes an enormous section of the economy, with production, processing and distribution comprising 10-15 percent of many local economies. Yet, the people who work in that food chain are deeply segregated by race, gender and immigration status and the working conditions for too many are marked with unpaid wages and unsafe labor practices. For decades, low-income communities of color have suffered as grocery stores and fresh, affordable food disappeared from their neighborhoods. So much so, that it has become an article of faith among some policy makers and advocates, including Michelle Obama, that poor urban neighborhoods are food deserts, bereft of fresh fruits and vegetables. Studies have been conducted that support the hypothesis that physical access to food is unequal. They found large numbers of supermarkets located in wealthy, predominantly white areas and relatively few in poor, black neighborhoods. Interestingly, they also found higher concentrations of places that sold alcohol in the poor, black neighborhoods. A similar study was conducted in New York which found that consumers in neighborhoods with high concentrations of black and elderly people face higher prices, lower levels of quality and cleanliness, and less variety of prices, brands, and sizes. Yet, despite the surprising links found, little attention has been paid to this topic up until now. Recent changes in food retailing structure have led to the development of large supercenters in suburban areas of the United States. These changes have led some authors to suggest that there are “food deserts” in some urban areas, where food is difficult to access, especially for disadvantaged consumers. Since the 1960s grocery stores have been moving out of our cities, taking with them access to high quality, healthy food and family sustaining jobs. Recent expansion in the grocery retail industry by big box retailers like Walmart has been characterized by low wages, a lack of health care and substandard working conditions. More than 50 million Americans live in food insecure households and grapple with health issues caused by increasing levels of obesity and related diseases like diabetes. 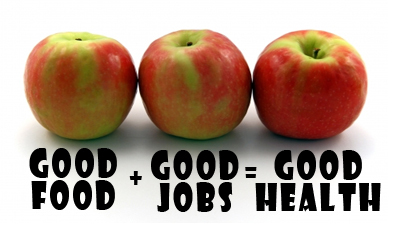 Working families rely on a thriving grocery retail industry to create quality jobs and provide access to healthy food. Removing barriers to quality food is central to achieving equity and community health in America’s cities. It’s no surprise that Americans are working longer hours than ever and, in many cases, more than one job. And, with more women joining the workforce and commuting times increasing, people have less time to prepare food. While the “Slow Food Movement” makes inconvenience in food preparation a moral virtue, it’s a hard sell for busy working families. It is especially true for minority populations, because traditions surrounding food are extremely important to form the sense of identity of minority populations. What food is has fundamentally changed in these people’s minds as traditions are gradually replaced with buying a burger from a fast food restaurant like McDonald’s. The meaning of food a typical American has changed dramatically in the past one century. Most food traditions have been lost in food desert areas, along with the recipes that were handed down for generations. Families no longer gather for big Sunday dinners. Food is now viewed as something to be enjoyed, rather than as sustenance or a connection to family and traditions. Unfortunately, people in food deserts are so used to their limited options that they aren’t even aware that there’s a serious problem. They grew up eating their meals from fast food restaurants and convenience stores. It’s all they know and it’s what they give their kids. If it sometimes seems that Americans are addicted to fast food, it might be that we actually are. Studies have repeatedly found that the consequences of bingeing on high-calorie, high-fat foods mimic the effects of drug addiction. A recent study by the Scripps Research Institute found that gorging on fast food actually changes the brain’s chemical makeup, making it more difficult to trigger the release of dopamine (aka “the pleasure chemical”). Researchers have found that energy-dense foods (those that contain the most calories per gram, which is to say sweets and starchy foods) — are far less expensive than low-energy and nutritious foods like fruits and vegetables. In fact, measured on a per-calorie basis, they are one tenth the price. The hardships faced by Americans living in food deserts is the largely untold story behind legal and other efforts to fix the American diet—stories on the failed soda ban in New York, for example; the state law in Mississippi that prevents municipalities from adopting nutrition rules (like soda bans or menu calorie and fat information); and repeated soda tax proposals in Nebraska, Hawaii, and many other states. The dominant constraint in the lives of low-income people is lack of money. From 1985 to 2000, the prices of fresh fruits and vegetables rose 40 percent while prices of fats and soft drinks decreased by about 15 and 25 percent, respectively, noted Arielle E. Traub, a Senior Systems Analyst at the New York City Health and Hospitals Corporation in a report she wrote for the Johns Hopkins Bloomberg School of Public Health. However, as with so many problems, education seems to be the most reliable long-term answer. But nothing in the field of nutrition is straightforward. Many factors contribute to an individual’s body weight and overall dietary health. These include individual factors, such as demographic characteristics, socioeconomic status, education, and preferences for food. Environmental factors can also impact body weight and dietary health. Such factors can include access to stores and restaurants, parks and recreation facilities, sidewalks, and the availability of public transportation, and social environmental factors like crime, neighborhood cohesion, and the social and cultural norms around food. For a community to have good nutrition, three conditions are necessary: food must be affordable; food must be available; and individuals and families must have enough education to know how to eat better. One of the most consistent predictors of health, including reduced obesity, is higher maternal education. This has been found across cultures. There are many excellent educational initiatives that aim to teach young people about healthy eating — like the Healthy Schools Program and Cooking Matters. But if raising the level of education of mothers is one of the most reliable ways of improving family health, it may make sense to think of general educational efforts. Just as the problem of obesity is connected to poverty; it is connected to education. Research has shown that individual factors can explain some differences in who becomes obese or who acquires diabetes, but alone, they cannot account for all the differences in rates of these diseases. The food environment and food store access may help explain differences in diet and health outcomes. Much of the research on food access draws on business data sets, which include things like types of businesses, locations and sizes, but not information about, say, the quality or variety of food in a store. Food deserts are almost always food swamps, meaning that where they are lacking in access to wholesome groceries choices, there is an abundance of unhealthy, fast-food opportunities. Sugar, processed carbohydrates (such as candy, juice, white bread, and chips), and trans fats commonly found in fast foods contribute to the inflammatory response characteristic of triggering asthma. For the children of low-income families, food deserts, food swamps and air pollution conspire in their communities with a one-two-three punch that makes kids sicker, poorer-performing academically, and less physically active. Families are under siege from a barrage of factors when the air is dirty and when there is no access to healthy, wholesome food. They cannot fight alone. Given that food is a basic human need, it is amazing that people almost always failed to figure out his riddle. More broadly, it is astonishing how often food is overlooked in so many vital policy discussions. (The neglect spills over into pop culture: In the earliest version of the classic computer simulation game SimCity, you could decide where to put a football stadium or museum but not where food stores or markets should be.) For most of U.S. history, urban planners have usually ignored food issues in their grand schemes. Food desert locations, by definition, aren’t profitable, according to Nelson Lichtenstein, director of the Center for the Study of Work, Labor and Democracy at the University of California at Santa Barbara. In general, the profitability of industrial food- processing firms increases in a linear fashion with firm size. Nonetheless, there is evidence that small-quantity, on-farm processing can be economically viable because the processors are able to keep their costs low by using family labor and on-farm kitchen facilities. The costs to produce organic and non-organic processed foods are very similar. Nonetheless, organic processed foods are generally much higher priced. It appears that the path to profitability for community-scale processors is to achieve a high margin on small production quantities as opposed to the industrial strategy of producing high quantities of low-margin products. We need an entirely different mindset. Food should be a central organizing principle for neighborhood development, uniting residents through community gardens, farmers’ markets, supermarkets, food cooperatives, and food- related small businesses. Community gardens can reclaim empty lots from drug pushers. Food businesses can create jobs and raise community income. Farmers’ markets can give neighborhoods central gathering spaces and nurture a feeling of the “public commons” that is so often lost in today’s society. This new mindset will benefit both our economy and public health. Food deserts, as they’re traditionally defined, assume a world without transportation. The United States Department of Agriculture measures them this way: A Census tract is considered a food desert if it meets a certain threshold of poverty, and if at least 500 people or one-third of the population reside more than a mile from a large grocery store. This definition assumes that people only access supermarkets within a fixed – and arbitrary – radius of their home. And it sidesteps the reality that many people ride transit or cars to get there. And they’re models that completely miss the picture of human mobility. This is just one of many criticisms of food-desert maps (another common one is that they dismiss healthy food sources like corner bodegas). But if we could more realistically capture where people shop and how they move through their day – accessing grocery stores close to work, for example that could help us better identify who’s really at risk and what would help them. Widener cites three factors that influence access to healthy food: spatial access, economic access, and social food norms. And those factors vary in degree from place to place, even person to person. For a community to have good nutrition, three conditions are necessary: food must be afford- able; food must be available; and individuals and families must have enough education to know how to eat better. If you don’t have all three legs of this stool, it will collapse. Yet all too often, projects only focus on one of the three. Many provide nutrition education, lecturing people that they should eat better, but make food neither more available nor more affordable. Some times, food is brought into low-income neighbor- hoods, but at prices too high for most people to afford. That won’t work either. The only way to truly succeed is to focus on all three aspects of this problem at once. Mobility, however, does color our existing picture of food deserts. But once you start thinking about mobility, other solutions seem feasible. Why not create express bus service from some neighborhoods straight to the supermarket? Solutions must address the broader issues of affordability and need and the particular U.S. style governance regime that limits what personal responsibility can do. The president, Congress, and the private sector must continue to work together to implement serious plans to create living-wage jobs in every low-income neighborhood and community in the nation. Now is the right time for the federal government to initiate a large-scale Good Food, Good Jobs program to create food-related jobs in areas of high unemployment, and to seriously examine the effectiveness of community food security efforts in boosting the economy and improving public health. This entry was posted in Uncategorized and tagged Apple pushers, children, education, environment, food, Food desert, Food Desert Film, Free, grocerystore, health, humanity, life, live, love, McDonald, medicine, Michelle Obama, motherhood, Poverty, Public Health Crisis, Science, Scripps Research Institute, Ted Talks, United States, wellness, youtube.com. Bookmark the permalink. 6 Responses to Want To Know Where You Can’t Buy Fresh, Healthy Food? Grande contenu que vous avez ici.